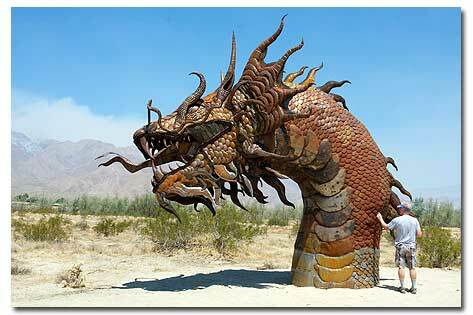 A new serpent has risen from the dry, hot sand in Borrego Springs, CA. It’s head rears up towards the sky in a graceful depiction of a serpent in motion. The 350-foot serpent is the newest edition to a garden of 129 metal sculptures that are placed in Galleta Meadows Estates. The sculpture garden is the vision of Dennis Avery, who envisioned free-standing art on his property that represented wildlife and history of the area. 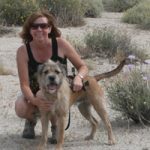 As you drive through the roads that weave through the garden you will see sculptures of wild horses in the nearby field, sabertooth tigers in pursuit and desert tortoises that seem as it they are crawling through the brush. The artist, Ricardo Breceda, brings life to his sculptures by capturing each creature in motion. They are so still, yet all you see is movement. The sculpture garden is open to the public. Visit our information page about Galleta Meadows for more information and for a map.